We can all help prevent suicide. 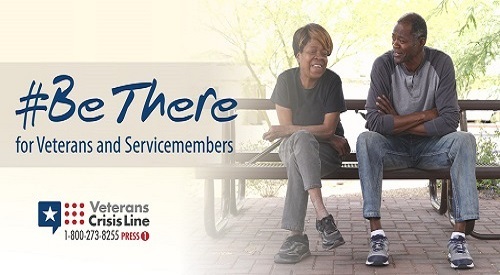 The Veterans Crisis Line provides 24/7, free and confidential support and resources for you or your loved ones. With every purchase VCS gives back to Veterans through programs created for the wellness of our nation’s heroes. Thank you for making a difference! 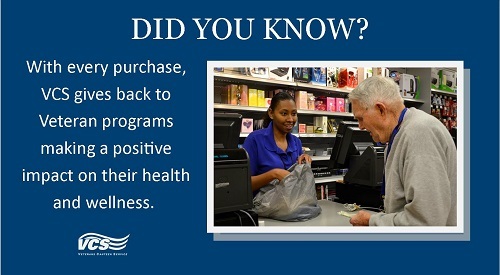 Veterans Crisis Line PatriotStore Sale Event Did you know? Established in 1946, Veterans Canteen Service (VCS) was created to provide articles of merchandise and services at reasonable prices to Veterans enrolled in VA healthcare system, caregivers, and visitors. Since its conception, VCS’ mission continues, incorporating a strategic Veteran-centric approach emphasizing the importance of service to Veterans and supporting VA’s overall mission. VCS provides retail, food, coffee, and vending services across the country. Enjoy a quick bite to eat in the PatriotCafé SimplyToGo area. Check some of our new fresh and delicious snack options like the protein packs filled with red seedless grapes, cheese cubes and almonds or a soft salted pretzel with warm cheese dip. For a lighter meal, select from a variety of salads such as a Grilled Chicken or the Harvest salad to satisfy your hunger. Keep it Healthy! Over half of the salads available in the cold cases are "Cal Smart" meaning they are less than 400 calories making your meal better for you. We are committed to ending Veteran homelessness. Did you know VCS has provided over 10,000 mattress sets and over 4000 move-in kits to Veterans who were placed into housing? VA is helping homeless Veterans move into permanent housing and we are honored to give them a bed to sleep on and basic kitchen, bath, and bedroom household items to help them adjust easier.